Comments Off on New computer! So, I was playing Skyrim the other night, was mixing it up with some necromancers in a cave, and the computer turned itself off. This has happened before; I think the fog in the caves overtax the processor and it overheats. I tried again, and just as I was either smoking or getting smoked by the Draugr Overlord, it crashed again. And wouldn’t reboot. Damn. I let it cool down overnight. Next day it wouldn’t boot at all– it just issued plaintive beeps. Damn. I hauled it to Best Buy. And then… well, I don’t have that much income. But it costs $70 for them just to look at your computer, plus probably they’d have to replace the motherboard (it’s gone out twice on this computer) and I’d lose all my data anyway (if it’s recoverable, they charge like $90 just to save a copy). Plus, who wants a computer that can’t play Skyrim? So I looked at new computers. Apparently a lot has changed in four years. Traditional desktops are almost out, and they’re smaller anyway. 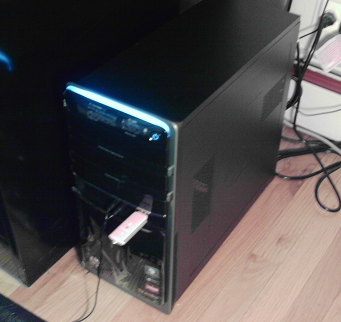 And not too expensive: this one is more powerful than the old computer (quad core, 8G RAM, 1T disk space, Radeon HD6530D graphics card) and cost less, $500. Speaking of money, did you know Geek Squad will charge your grandma $100 a year for ongoing tech support? I suppose when I’m 90 I’ll be wishing I had kids to get my damn neurimplant rebooted. The big disadvantage, of course, is that I lost any data that I hadn’t backed up. I’ve got Warwarpath saved, fortunately. And game saves that were in Documents as of a month or two back. I lost a beautiful page on politics, however, plus the URL of the most useful source for it. (Back up your computer frequently, kids!) Plus a hundred Steam games need to be downloaded again. Plus, I think it was worth it to get a new system without Windows 8.